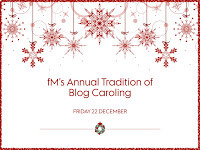 Genea-Musings: Blog Caroling - "Angels We Have Heard On High"
I like the Latin in this song, too. Reminds me of growing up in Passaic when Nana took me to visit just about every Catholic church in the city. Masses were all in Latin until c1962. Merry Christmas, Randy and Linda! Good choice Randy! Another of my favs! I love this carol, too, especially the "glorias." It's such a great rejoicing carol. Merry Christmas to you and Linda, Randy.